Jugs! There, I got your attention. But, similar to the spate of twee tea infusers of late, a gimmicky milk jug is a great thing. 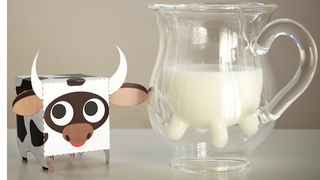 This one, which features udders, will never let you forget what you're actually pouring voer your cereal: 2% cow juice. This soy milk jug had the same idea—but it's sad in comparison, because soy.